Hey New Year's Eve Eve, this is the night you really stay up late. 3) to wait out the yeast cycles of vasilopita whilst completing goals 1 and 2. Vasilopita is one of my most favorite things. The smells it brings to the house, the glory of toasting it 3 days later then slathering it with whatever you have in the fridge and discovering just how good everything tastes on top of buttery-rich vasilopita, staying up late to make it (and of course, sneaking a slice before bed - why wait? ), oh there are just too many good things about this sweet, yeasty bread! Moments like these, I'm so grateful to be Greek! 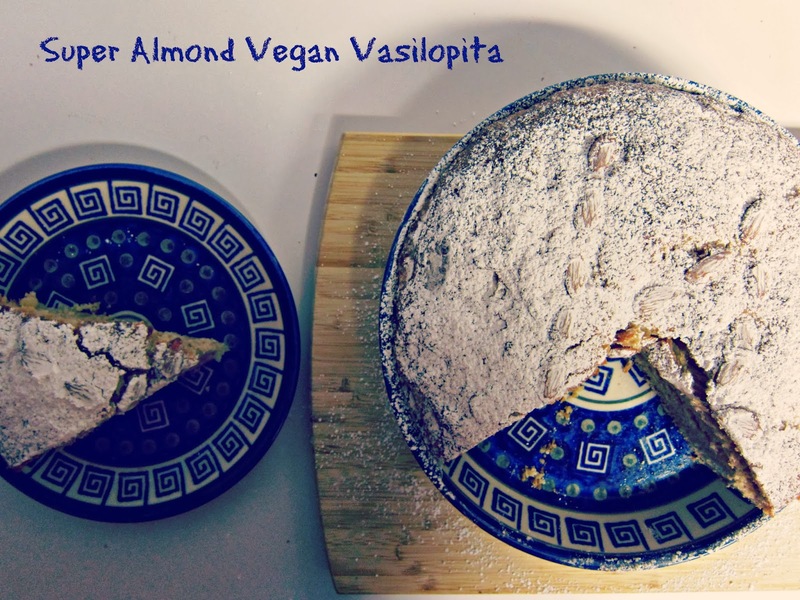 I last posted a vasilopita recipe four years ago - this was when I made "crazy vasilopita," and it was so awesome (note, I like colorful things) that I was tempted to make it again. Maybe next time around. 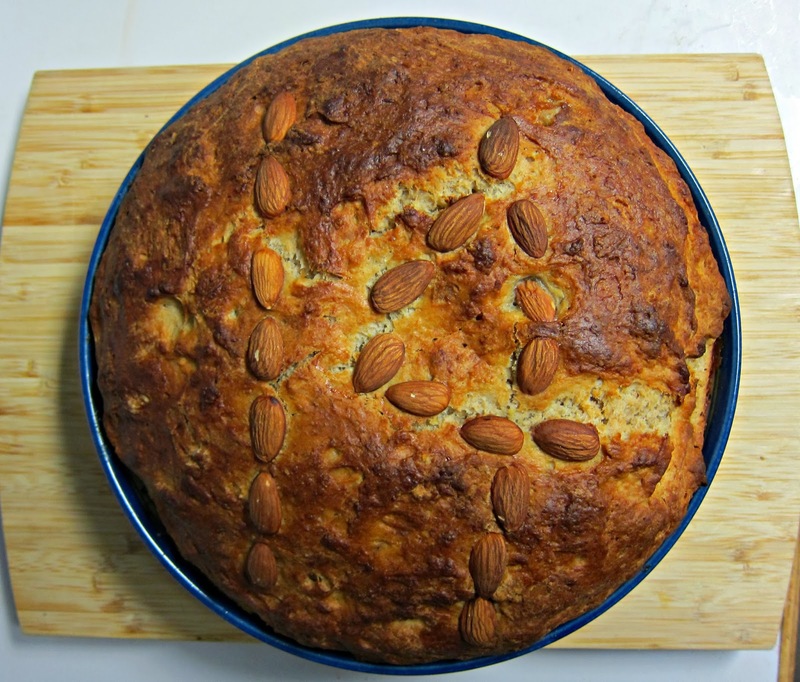 This time around, I made a vegan version, with 4 pows of almonds: almond milk, almond flour, almond paste and almonds on top. Almond goes so well with the mastiha and mahlepi and it's just an enchanting overall flavor. I've been experimenting with flours as usual, and really been hooked on spelt flour, so I added some. Vegan butter aka Earth Balance was used but next time, I'd like to try coconut oil, so feel free to make this super natural. Also, some vasilopita is made in a more a cake style with baking powder which I have personally never experienced in my family circle. Now I am wondering if the yeast version is more of an Asia minor Greek thing or just a coincidence. Anyone know? One of my goals for 2014 is to cook more Greek inspired food. I'm also hoping to make it back to Greece after a four year hiatus and bring the husband for the first time. Wishing you all the best in 2014! I toted this almond paste back from the East coast! Gently warm almond milk, then pour into a large bowl with yeast, 1 cup of flour, salt and 2 tablespoons of sugar. Cover with plastic wrap and let stand for about an hour in a warm place to become spongy and rise. In a small bowl, combine the warm water and flax seed. Let rest for 10 minutes. In a large bowl, mix together the rest of the flours, rest of sugar, malepi, masitha and lemon zest. Cut in the butter with a pastry blender so it becomes almost mealy. Add flax seed mixture and yeast mixture. Knead the dough, adding more flour if necessary until a soft, smooth ball has formed. Shape the dough into a large ball and place in an oiled bowl, cover with plastic wrap and let rise for about 2 hours or until doubled in size. Knead again and place back in oiled bowl to rise a second time. Insert globs of almond paste into ball. Cover with plastic wrap. Pre heat oven to 350F. Knead a few more times to evenly disperse almond globs. Either free form shape of vasilopita or use a pie dish to form it for you. Let rise for about 20 minutes. Insert coin wrapped in foil into dough in a place where you won't remember. Using almonds, spell out 2014 or just 14 in my case on the dough. Brush with almond milk. Bake for about 40 to 50 minutes or until very golden. Let cool and dust with powdered sugar if you like. Happy 2014! The nest time I come to Portland, I'm going to beg you to cook for me. Greek feast! Yummm! Delicious vegan food is one reason why the number of vegans has doubled in less than 3 years. Loooove the idea of using almond meal and marzipan. Brilliant. Kalo xprono, Anna! Laura - For sure I will. Come back soon! Elly - Kalo Xrono Elly!